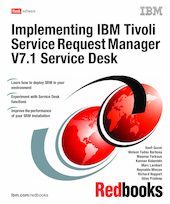 IBM Tivoli Service Request Manager V7.1 provides a unified and integrated approach in dealing with all aspects of service requests to enable a "one-touch" IT service experience, backed up by an optimized delivery and support process. It is a powerful solution that closely aligns IT operations and the business, improving IT service support and delivery performance. Concepts and components: Provides an overview of the IBM Tivoli Service Request Manager product Service Desk functions and some of the standards that drive its development. Also provides the reader with a better understanding of the various components, logical and physical, that make up the product and the functions that they provide. Planning and Installation: Provides information related to the actual installation of the IBM Tivoli Service Request Manager product components, including information related to hardware and software requirements. Demonstration scenarios and best practices: Focuses on demonstration scenarios using some of the new features of Tivoli Service Request Manager, such as reporting, survey, and search functions. We also provide best practices for fine tuning and high availability of Tivoli Service Request Manager components.